Danforth Diamond offers a lifetime warranty on all of our products against defects in materials and workmanship. 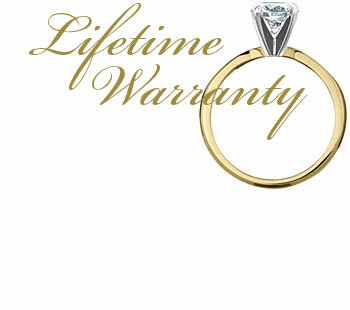 The warranty also includes one free ring resizing by one full size up or down. Some eternity band styles and our patterned wedding bands are impossible to resize, are considered Special Order and are NOT returnable. Please keep this in mind when ordering and ask for sizing assistance if needed. All of our rings are inspected for quality before they leave our facility, however, some stones may become loose over time due to regular wear and tear. This is not due to a manufacturing defect but it is our policy to tighten and clean all jewelry one time per year under warranty. This warranty does not include accidental damage, theft, stone loss, or damage that is not due to manufacturing defects. In addition the warranty becomes void should another jeweler alter the product in any way. The warranty does not include shipping to and from our facility which will be a $20 charge. It is our policy to only use authentic and natural diamonds. Our diamonds are not enhanced or altered in any way. All of our diamonds come from reputable suppliers. We do not currently sell nor will we set man made diamond substitutes.